Running hard, eating well and living a grace-filled life in Washington D.C. I received a number of questions last week after posting my September blog stats and income and I’ll be tackling some of those questions in upcoming blog posts. 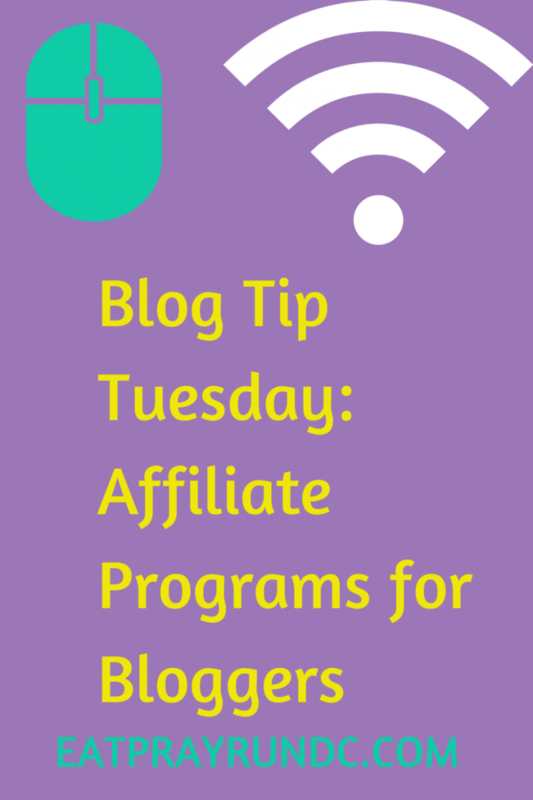 Today, I wanted to dig into affiliate programs for bloggers and share some basics about what an affiliate program is, what affiliate programs for bloggers do, and some affiliate programs for bloggers that I am a part of. What is an affiliate program? An affiliate program is a program offered by a business to reward and offer incentives for others to share products or information about that business. In a typical affiliate program, the business will offer a percentage of sales for a referral or an agreed upon amount per referral. What affiliate programs for bloggers do? Affiliate programs for bloggers operate in the way I described above. A blogger will be given an unique code and will receive a referral fee for everyone who uses that code to make a purchase. Often, when you see links to products in a blog post, those are affiliate links. What affiliate programs am I a part of? I am a part of both Bluehost (my hosting server) and Amazon affiliate programs. That means that if you were to click on this new Fire HD 6 and purchase it, I would get a small commission. I like Amazon’s affiliate program because I use Amazon all the time anyway and sometimes share products I’m using, clothes I’m wearing or books I’m reading and so it is easy for me to share that through Amazon (edited to note: you can not use your OWN affiliate link to purchase items – that is against the rules). I would never join an affiliate program for a business I wasn’t already using and loving. There are so many affiliate programs out there! One way to find a good one is to join an affiliate network. One that I’ve recently joined is Mom’s Affiliate – obviously you don’t have to be a mom to join. I joined because I wanted to see a bunch of different affiliate programs and then choose if I wanted to join any more. There are seriously tons. Right now I’m happy with the ones I’m using, but Mom’s Affiliate does have a few for things I’ve been meaning to try like the website Zulily. That site keeps popping up when I’m on facebook so I think their algorithm knows something I don’t and I need to check it out! Whew. Felt like that was a mouthful. Are you a part of any affiliate networks? Any suggestions of great ones other readers might want to check out? note: there are affiliate links for some of my favorite affiliate networks in this post. I never recommend or link to something that I don’t love! MCM Mama recently posted…Tuesdays on the Run: Where has my running gone? i am not an expert in this, but from my understanding i have both a static page noting my disclosure policy AND i note any affiliate links or if a post is sponsored in the individual post. i think the important thing is that you DO disclose (i see a LOT of bloggers using affiliate links that don’t disclose). Good info as usual. I’ve been wondering about the amazon affiliate program myself so I am going to check it out. I’m probably ordering something from there everyday. I signed up for amazon’s program. I have not heard about mom’s. Will check it out. Thanks! i actually can’t remember where i found them, but they have a TON of programs! I recently signed up for the bluehost affiliate program and I’m looking into a couple others. Thanks for sharing! oh great — you should definitely check out mom’s affiliate because they have SO many different options for programs! As usual, great info Courtney. I’m starting to highly consider making the jump to self hosted, and if/when I do I’ll definitely consider Amazon affiliate. Correct me if I’m wrong, Amazon affiliate is a violation of the Word Press terms of agreement if you aren’t self hosted, right? But once you sign up there, you can become an affiliate for multiple sites, like Reebok, Adidas, ProCompression, Bioskin, and Zulily. Then if you link to something on your site from one of those sites, you can go to Shareasale and get a special link that will give you credit when someone makes a purchase. Plus, I’ll get an email a couple days ahead of a sale so that you can prep your social media to share. Recently Reebok had a huge sale and I made more money from one sale than I did in probably six months of affiliate sales elsewhere! I’m signed up for Bluehost and amazon but need to be more proactive about the links. I think it helps to write a blog post about Bluehost..did you do that? I haven’t checked your income post but I’m curious how successful you are with Amazon because I’ve heard mixed reviews. Very interesting! I have seen disclaimers on blogs but never really knew what they were talking about. Geez, I promote fitness clothes so much on my blog that I should look into this! Carmy recently posted…Inside My Mind: THE TAPER HAS STARTED! How to Stay Motivated! happy to help! i’m learning as i go! I’ve just started using affiliate links. I’m really liking them so far! glad to hear it’s working well for you! Lol I wish I could accidentally make money like you girl! Do you find that most readers will buy the amazon product by clicking on the link on your blog? I know I very rarely purchase something online the very first time I see it. If I saw it on your blog, I would probably think about it and then go to Amazon directly when I am ready to buy it. Thanks for letting me know this because in the future if you post something I would want to buy, I will make sure I come back to your page and click the amazon link through you! with amazon they don’t have to buy the linked product – it can be any product as long as they reach amazon through the blog. so i don’t think people have often bought what i’m linking to but just something they needed. thanks, meranda! Great info. I need to check out the Amazon affiliate. I spend so much there already. they have links to a ton! I am part of an affiliate program – heck MANY but they don’t really work for me. I forget to add links to my posts so I guess I just stink at it. It isn’t authentic for me. i’m usually adding a link to a product i’m raving about anyway – to make it easy for my readers to find it so it was something i was already pretty accustomed to! Once again thank you for this information!! How do you sign up for Amazon? Eventually I would definitely like to sign up for affiliates. Right now though I need help with Web design. Any tips? honestly i don’t remember but if you google amazon affiliate it will pop up! it’s a great program – i recommend it. as far as web design, that is an area in which i know pretty much nothing 🙂 good luck! This is a part of blogging I haven’t even dug into yet. Add it to my to-do list! I just signed up for Linkshare, and always use shopstyle for clothes that I post. I haven’t heard of the mom one- def going to check that out! I have been a part of the Amazon program for a long time. I do have a general disclosure but I’ve started adding a note at the bottom of the post too that the post contains affiliate links. I was thinking of just putting one in my footer so that it covers me that links may be affiliate links. I had Zulily on my shareasale account but it didn’t really “go” with my fitness theme, although they have fitness items sometimes and I love Zulily. They may have come out with more targeted banners by now. I have a Knuckle lights ad where it’s affiliate now since I love them! I only want to do this for things I believe in anyhow. Like RoadID – I’m an affiliate. I almost never get anything for it but I believe in the product so I keep the link/ad there to spread awareness of the product. Join the Eat Pray Run DC Community & Get Your FREE Copy of Blogging 101!